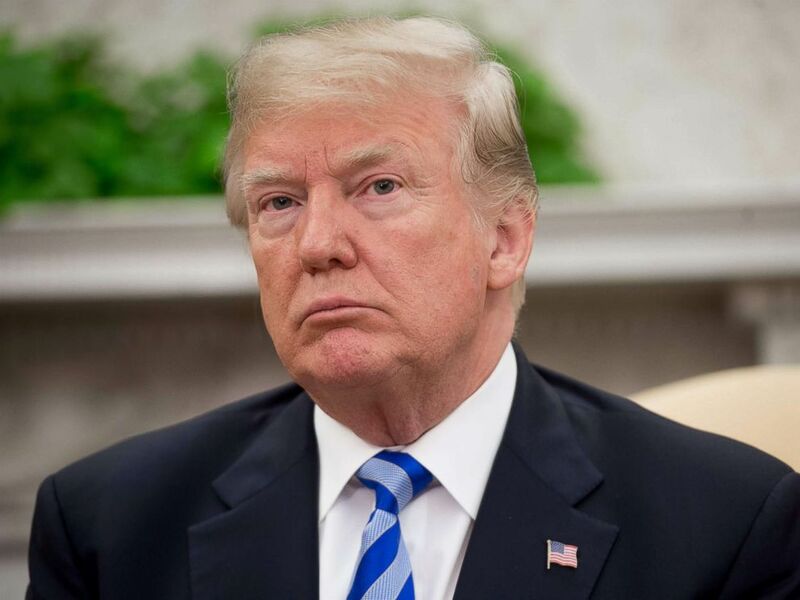 President Donald Trump is amplifying a chorus of conservative voices alleging that the Department of Justice planted a spy inside his presidential campaign, a claim his top lawyer has said, if true, would undermine the legitimacy of the special counsel's Russia investigation. In a pair of tweets Friday morning, Trump appeared to refer to right-leaning news outlets that have questioned whether the FBI had actually planted a source in the Trump campaign in order to gather information about it, but he left unclear exactly what story or sourcing backed those claims. President Donald Trump speaks during a meeting with President Shavkat Mirziyoyev of Uzbekistan in the Oval Office of the White House in Washington, DC, May 16, 2018. Reports are there was indeed at least one FBI representative implanted, for political purposes, into my campaign for president. It took place very early on, and long before the phony Russia Hoax became a “hot” Fake News story. If true - all time biggest political scandal! On Thursday, Trump made a similar allegation in a tweet seemingly appearing to reference a National Review columnist. DOJ spokeswoman Sarah Isgur Flores offered no comment when reached by ABC News about the president's claims on Twitter. The claims from the president and his allies come as The Washington Post has reported that top White House officials agreed to back the DOJ’s efforts to resist turning over certain documents to Congress so as not to reveal the identity of a U.S. citizen-- who has provided intelligence to the CIA and FBI--because doing so might put lives at risk. The New York Times also reported that a government informant met with former Trump foreign policy campaign advisers Carter Page and George Papadapolous. But on Friday morning, amid Trump's tweets, the former New York City mayor told CNN that the president didn't know "for sure" if there was a spy on his campaign. “I don’t know for sure, nor does the president, if there really was one,” he said. The claims from some conservatives and the president appear to be based, in part, on testimony that Glenn Simpson, the former journalist and co-founder of political research firm Fusion GPS, gave to congressional investigators in August of 2017. Simpson's firm was hired by a Republican client to investigate Trump in early 2016, an effort that Democrats began funding around the time Trump clinched the GOP presidential nomination. Simpson told the Senate Judiciary Committee that Christopher Steele - the former British spy employed by Fusion GPS to research Trump - told him that the FBI had information from an “internal Trump campaign source” that corroborated some of the information that Steele had shared with the FBI, but he declined to identify the source. “They believed Chris's information might be credible because they had other intelligence that indicated the same thing and one of those pieces of intelligence was a human source from inside the Trump organization,” Simpson said. He later clarified that he wasn’t sure whether the source was part of the Trump campaign or organization, according to a transcript released by Sen. Dianne Feinstein, D-Calif.
House Intelligence Committee Chairman Devin Nunes, R-Calif., strides to a GOP conference joined at right by Rep. Peter King, R-N.Y., also a member of the Intelligence Committee, at the Capitol, Feb. 6, 2018. House Intelligence Committee Chairman Devin Nunes, R-Calif. has been locked in a battle with DOJ leadership over classified documents "regarding a specific individual," according to a letter the Justice Department sent to Nunes rejecting his demand for the information earlier this month. "Disclosure of responsive information to such requests can risk severe consequences, including potential loss of human lives, damage to relationships with valued international partners, compromise of ongoing criminal investigations, and interference with intelligence activities," Assistant Attorney General Stephen Boyd said in the letter, which also claimed that the White House supported the Justice Department's decision to withhold the information. “What we’re trying to do is get the documents to figure out, did they actually have, what methods were used to open this counterintelligence investigation,” Nunes said on “Fox and Friends” this week. 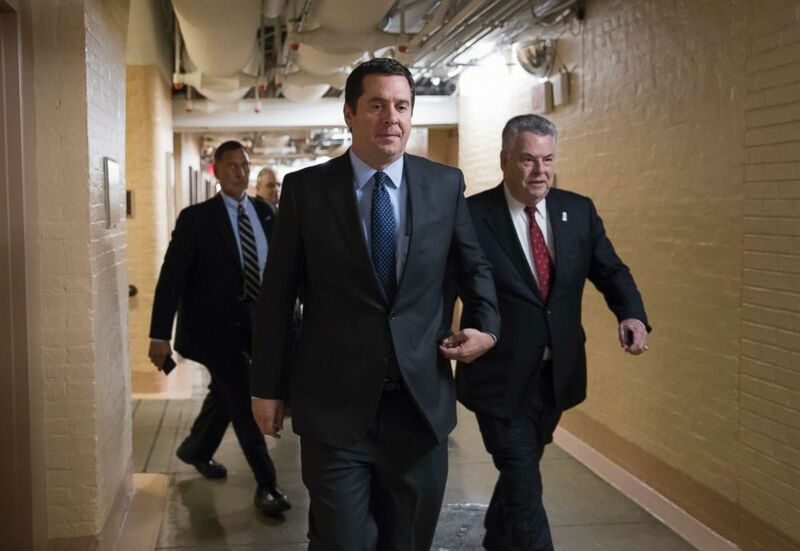 Nunes and Rep. Trey Gowdy, R-S.C., met with Deputy Attorney General Rod Rosenstein and top law enforcement officials last week at the Department of Justice about the request. Rep. Mark Meadows, R-N.C., the chairman of the House Freedom Caucus and Trump confidant who has discussed the investigation and the Department of Justice with Trump, is demanding the disclosure of a DOJ memo describing the scope of the Mueller investigation, something congressional Republicans have been seeking for months. Meadows and Rep. Jim Jordan, R-Ohio, recently met with White House chief of staff John Kelly over concerns about the pace of DOJ disclosures to Congress. “I can tell you that the president has been consistent about wanting greater transparency and so I don’t know that this would be at odds with what he’s been espousing for a number of months,” Meadows told ABC News on Thursday. The Justice Department has repeatedly resisted requests to turn over information regarding the source, citing national security concerns. FBI Director Chris Wray, speaking at a Senate Appropriations Committee hearing Wednesday, defended the agency’s approach to congressional oversight requests, amid the tension with House Republicans. ABC's Devin Dwyer contributed to this report.